Fantastic reference for grains and getting more of them into your meals. 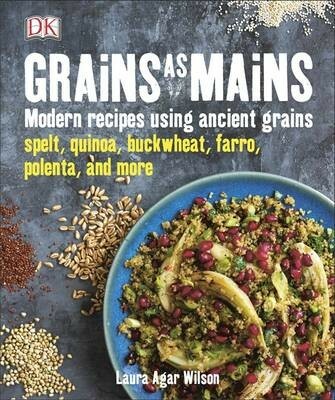 This title features modern recipes, ancient grains. Grains as Mains satisfies your appetite for tasty, versatile and healthy grains, with over 150 fresh and exciting recipes, many of which are gluten-free. Ancient grains such as teff, quinoa and buckwheat, first cooked thousands of years ago, are now very much back on the menu. These grains are great for us, nutritious, protein-rich and have excellent textures. This comprehensive cookbook is overflowing with step-by-step preparation techniques showing you how to prepare and cook key ancient grains, from familiar favourites, like quinoa and polenta, to unexpected delights, such as teff and freekeh. With over 150 easy healthy recipes where grains are the star ingredient, from soaked buckwheat pancakes and cherry almond sauce, to Italian tomato and vegetable barley risotto, there is plenty of experimenting to do.